Ian McHarg’s 1969 book, Design with Nature, is credited with helping redefine the field of landscape architecture in the era of global climate change. Described in Time magazine as “Not only a symbol of rising anger at environmental abuses, but a successful practitioner of the hard art of stopping those abuses,” McHarg has advocated for a newer, healthier relationship between the built environment and nature. This vision for human engagement with the land is as relevant today as it was 50 years ago. The field of landscape architecture has become a leader in the “green” revolution by embracing new technologies and advocating for their implementation across the spectrum of our built environment. Landscape architects are leading communities toward solutions that are more sustainable and environmentally friendly, providing residents with a richer quality of life. The following are only a few of the numerous tools that can be implemented in promoting sustainable outcomes. Comprised of grasses and durable plants that can withstand the most extreme conditions—including periodic inundation and severe heat—biofiltration swales receive stormwater runoff and slow it down, which helps reduce erosion and flooding. The swales and rain gardens also cleanse the runoff, naturally filtering out contaminants through phytoremediation before safely reaching sewer or storm-drain infrastructure. Plants used in these systems filter silt and pollutants, including heavy metals from water, which is particularly useful in urban and industrial contexts. This natural cleansing process prevents polluted stormwater from infiltrating local waterbodies and associated ecologies. These solutions can provide a wide range of protection, depending on the needs at a particular site. While swales generally collect runoff from larger areas, such as parking lots, rain gardens are generally more localized. Informed and strategic implementation of these techniques can substantially increase the health, safety, and sustainability of urban environments. One major issue of urban settings is the heat-island effect, a phenomenon in which a metropolitan area is significantly warmer than its surrounding rural areas due to solar-heat gain. Urban heat islands negatively affect communities by increasing summertime peak-energy demand, cooling costs, air pollution and greenhouse-gas emissions, and heat-related illnesses and mortality. Living roofs (also known as “green” roofs) are a popular and beautiful means of decreasing the negative impact of urban heat islands. The air-quality benefits of plants are well known. They cool the air, making the local environment more hospitable during excessively hot weather. The leaves from various species of trees and shrubs filter out dust and other particulates, and absorb carbon dioxide, making the air safer to breathe. Comprised of trees, shrubs, low-growth grasses, sedums, and other vegetation, living roofs can reduce building heating and cooling costs, provide habitats for wildlife, absorb and filter stormwater, and reduce the temperature of stormwater that is discharged into storm systems, lakes, and streams. This makes living roofs a space-effective and economical means of introducing the benefits of biomass to the rooftops of cities. Urban infrastructure, including streets and parking lots, diminish pervious surfaces available for the absorption of stormwater, resulting in pollutants and sediments that accumulate before ultimately being released into local water supplies. Landscape architects are combatting this problem through the implementation of pervious pavement, which allows water to migrate through “pores” or gaps in the paving system. This technology helps filter stormwater, automotive pollutants, and sediment that frequently accumulate in parking lots and streets. The filtered stormwater is then absorbed into the natural aquifers of the earth at a much slower rate than with a typical piped drainage system. Porous-pavement systems reduce the burden on municipal infrastructure and treatment facilities by reducing the volume of water being treated while avoiding costly infrastructure upgrades to increase system capacity. This provides a direct and tangible fiscal benefit to municipalities and their tax-paying residents, beyond the robust environmental benefits. The need for sustainable solutions has never been more important given increased urbanization, rapidly rising temperatures, and a decline in air quality. The values and advances outlined in McHarg’s Design with Nature have led to core practices that inspire positive environmental change within our communities. This article outlines only a few examples of how today’s landscape architects are crafting sustainable communities and enhancing the quality of life for both residents and visitors. 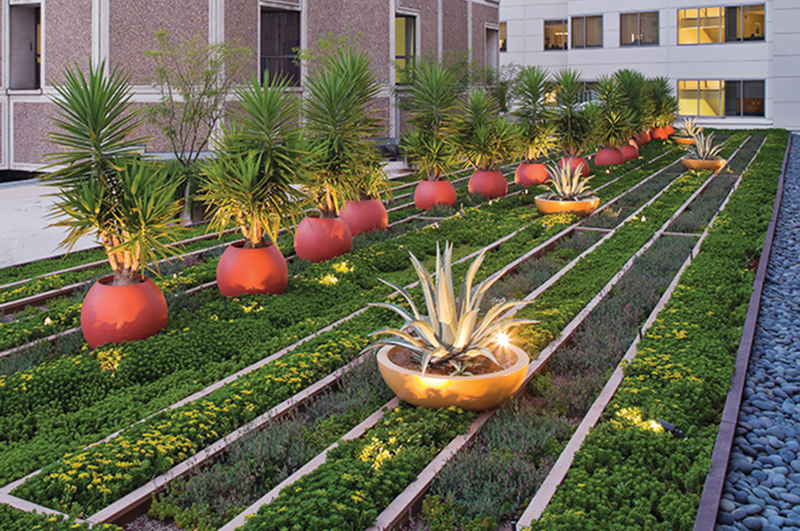 Thomas R. Tavella, FASLA, is studio Director, East Coast for Schmidt Design Group, and is a Past President of the American Society of Landscape Architects. Tavella can be reached at TTavella@Schmidtdesign.com.